We all know our surroundings, and the weather, play a large part in polluting the exterior of any property. Richmond occupies most of the islands in the Fraser River Delta. This means that, while it sees 30% less rain than the city of Vancouver and little to no snow, dense fog is quite common. The location of your property doesn’t matter. Whether surrounded by farmland, industrial or commercial property, the battle to maintain an aesthetically pleasing exterior is never ending. Why not bring in some help with our Richmond Window Cleaning Service. 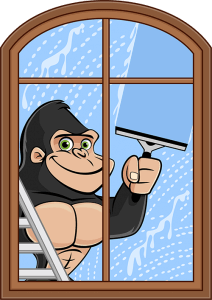 Our Gorillas recognise that, as a general rule, Richmond home and business owners simply want their properties to look their best. We also know your time is important to you. Taking on a Richmond Window Cleaning job single-handed is quite the lengthy task. More importantly, it is a futile one if not done properly. Most people reach straight for some newspaper or paper towel and that well-known blue spray bottle. They are unaware that this is the best method for creating static build-up, which attracts more dirt and dust. Using a combination of tried and true methods and state-of-the-art materials including pure rubber squeegees we guarantee a long-lasting, streak-free shine. This will maximise the exterior of your Richmond home or business and allow for a clear, unobstructed view of the outside world. Having clean, efficient windows is not the only reason to invest in a regular Richmond Window Cleaning Service; it could also save your life. Our technicians may spot problems you were unaware of. Identifying issues such as windows that are painted shut, or damaged, could be the deciding factor for a safe escape in an emergency. We can also make you aware of budding insect infestations. This givies you the opportunity to deal with it in the early stages.